Approximately 1 oz. wildcrafted white sage (Salvia apiana). White sage is also known as California white sage and bee sage. You can use white sage as an herbal incense. Burn the dried herb and bathe yourself or an object in the smoke. 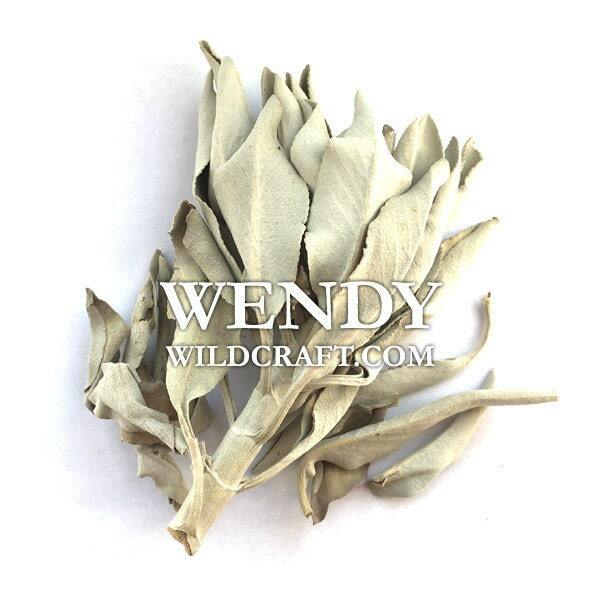 Place some white sage loosely in a fireproof bowl and ignite and then extinguish. Fan the smoke over the person or object. Fan smoke with your hand. You can also bundle the white sage incense to make an herb bundle. As with all other herbs white sage is beautiful and sacred. If you can, it's suggested to grow your own white sage due to white sage being overharvested in the wild. If you can't grow your own white sage and you wish to work with white sage, the white sage I sell is harvested sustainably. Great shopping experience with Wendy's WildCraft. Will definitely be back! Lovely!!!! I could smell all the herbs when I opened my mailbox!